When Tiffany Nicole fell pregnant with baby number four, her nesting instincts led her in a decidedly magical direction. 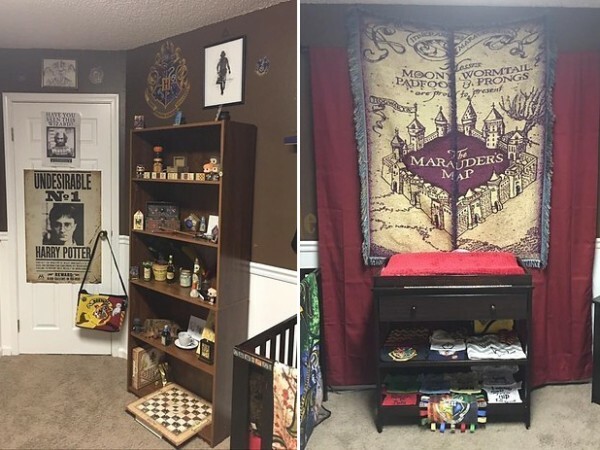 She designed a Harry Potter-themed nursery that’s straight from the halls of Hogwarts. 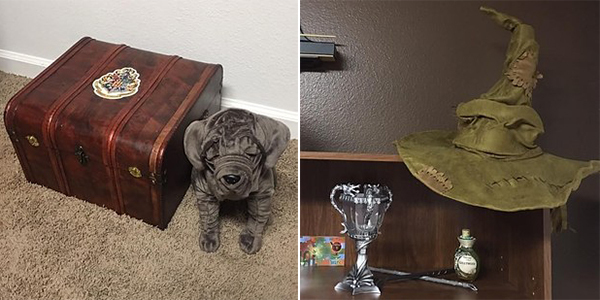 Tiffany and her husband are Harry Potter fans of the highest order. If we imagined an ideal world for them, there would be butterbeer at the local pub, and Quidditch would play on the sports channel. But even though they’re muggle-born, they still have a few spells up their sleeves. 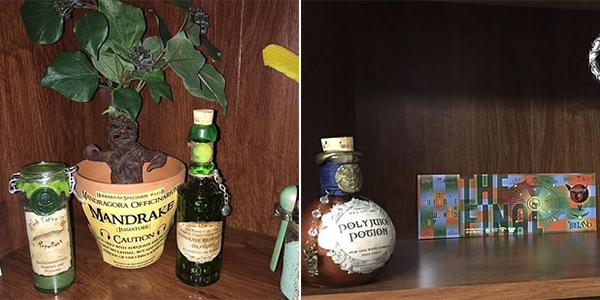 For example, a spell for magicking baby Carlisle’s nursery into a Harry Potter escape using the power of Etsy, Amazon, and maybe a little incantation. Not a detail has been overlooked in this bewitching room. There’s a lightning fast Firebolt broom, Harry’s beloved owl Hedwig, and a collection of rogue socks Carlisle can use to free house elves, in the event that he should encounter such a creature. If he’s feeling like wreaking shape-shifting mischief on his older siblings, Carlisle can sample the Polyjuice Potion, or crawl through the house following his very own Marauder’s Map. There’s even a Mandrake plant whose screams would make quite the dangerous ruckus when in chorus with a baby’s cry. 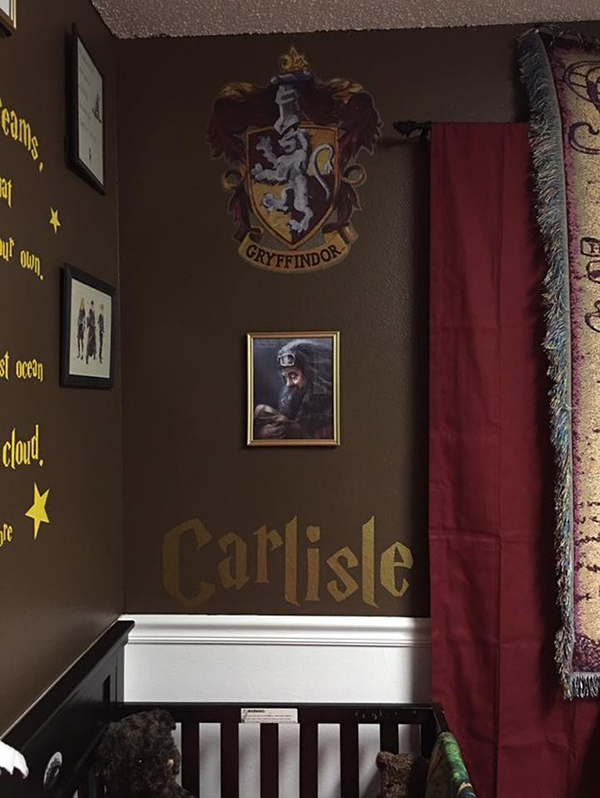 Tiffany Nicole may be a serious fan, but she definitely had some fun with this room, and we hope that Carlisle will share his family’s love for all things Harry Potter. 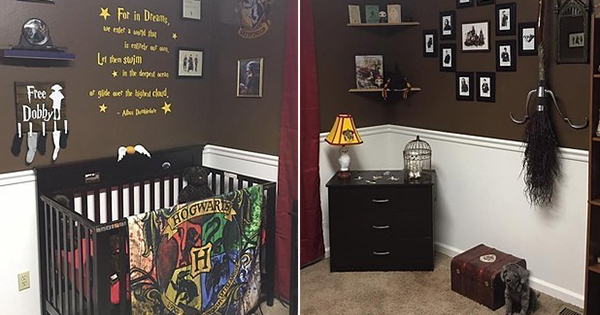 We’re not sure how a Gryffindor managed to convince Dumbledore to let him keep the Sorting Hat in his room, but some babies have magical powers from birth.